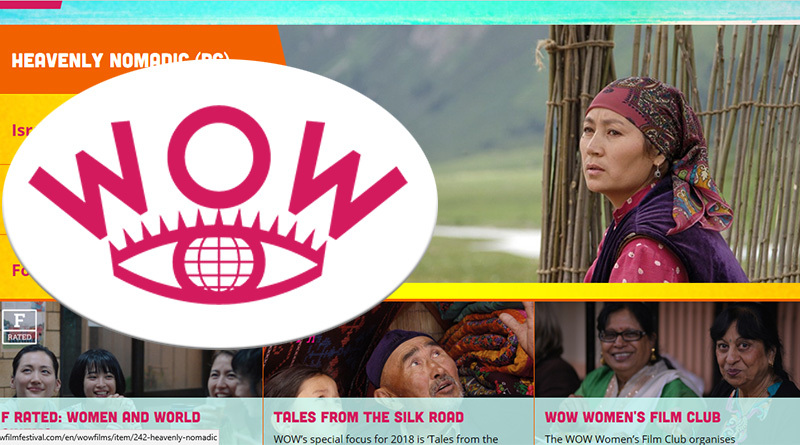 Hiu Man Chan (HMC): I know that WOW always has an interesting programme each year. How were the films selected for this year’s film festival? David Gillam (DG): This year was a little different as I chose a theme ‘Tales from the Silk Road’ for a season that makes up around half the films in the festival. A cinematic journey following the ancient trade networks from China through Mongolia and Central Asia to the Mediterranean. For this I worked with Birgit Beumers, an expert on Central Asian Cinema who recommended the best films from the last few years for me to look at. So I had a kind of ‘crash course’ in films from a part of the world I know very little about. Then I could select the very, very best. So a bit less random than usual and it gives WOW audiences a rare chance to explore a whole new world of cinema that’s seldom seen in the UK. The other half of the programme is chosen in the usual way; films that I love and think audiences will love too. HMC: Which is your favourite film(s) this year and why? DG: I never like to choose a favourite film as I like all the films in the festival in their different ways. But if I was forced to choose just three I would say Foxtrot is incredibly powerful and a real insight into a society at war. Something that seems very relevant right now. Israfil is beautifully made, every single shot seems so considered, ‘just right’ and has a fantastic central performance that really puts you deep inside the segregated women’s world in Iran. And then Free and Easy has a wonderful deadpan humour that really appeals to me and uses the ‘off screen’ space very smartly to tell the story. HMC: Why is it important for audience to be aware of films made in different culture? DG: The better we understand other people from other cultures the better we can get along. For me tolerance comes from understanding that our differences are mostly on the surface and once you look deeper we have more in common than may at first appear. HMC: How can we encourage audience to get used to watching non-English films with subtitles? DG: Well I think the most fundamental thing is to show good films that people really want to see. A lot of people in the UK watched films like City of God, Amores Perros, Y Tu Mama Tambien, Crouching Tiger Hidden Dragon, even though they were subtitled. I also think it’s really important to start young so there’s no mystique about reading subtitles. I didn’t really watch subtitled films till I was a teenager. But WOW always puts on one or two family films in the hope that parents will bring their kids to see them. Unusually this year we have two animated films – Mary & The Witch’s Flower which even though it was made in Japan is from an English children’s book and is set in rural England. And then there’s Big Fish & Begonia which is mind-blowingly beautiful so I hope that even if kids didn’t read every word of the subtitles they would come out really excited by what they’d just seen. HMC: Is there a possibility for your festival to expand across Wales, and to have more screening venues in the future? What is your plan and vision? DG: We’re always looking to take the festival to new places around Wales if we think there’s an audience there that will enjoy the festival. This year we’re running the festival in two new cinemas; Tramshed Cardiff and Kinokulture Oswestry. In the last six months we’ve also be screening Tomorrow/Demain, one of the most successful films from last year’s festival, in community venues, that are often volunteer run in West Wales and the Valleys. It really depends on finding good partners that will make all the work worthwhile. So, for example three of the ‘Tales from the Silk Road’ are playing at The Courtyard in Hereford as part of Borderlines Film Festival in early March. I’m glad to say that every screening has already very nearly sold out. So it shows people are interested to see subtitled films from countries that are rarely seen on our screens. HMC: In your opinion, in terms of attracting more university students to be involved in the festival’s promotion, is there a possibility to open a dialogue with different media departments in Cardiff for a credited internship? During this potential exchange, students may actually have an opportunity to experience working with a film festival and benefit from the insights into its organisations, something that they don’t normally learn from a text book. DG: I’d love to talk to the media departments at universities in Cardiff about an internship opportunity. Please tell me who to call! Most years we do have students volunteering to work on the festival while it’s on, but to do something more structured and longer lasting would require greater organization and commitment from both sides. HMC: What does film mean to you, and what can it mean to the public? DG: Well, that’s a big question as I’ve spent the last twenty-five years working in the film business so it meant a lot to me for a long time. Recently I came across an interview with Jodie Foster and this quote kind of resonated with me. As a festival director I too am interested in films that help me understand my place in the world. For me film is a tool, like a microscope or a telescope that helps me get to know a little about other people, other places and my relationship with them; the texture of people’s lives ‘over there’. For some years, it’s not until I have the festival brochure in my hand and look at the selection of films all together in one place that I really recognise what it is I’ve been unconsciously exploring this time around. ← Why do we buy bottled water?